Workflow Builder is the component that provides a graphical user interface for creating, reviewing, and maintaining workflow definitions. A workflow definition includes the workflow processes, attributes, notifications, messages, and functions that make up the workflow. Like Oracle Applications, Workflow Builder has a Navigator to help you find the various components of your workflow definition. Workflow Engine is the component that executes and enforces the defined workflow processes. When a workflow process starts or a step is completed, the Workflow Engine is signaled. The Workflow Engine receives and reads a signal from the defined workflow processes and then determines and executes the appropriate next step. 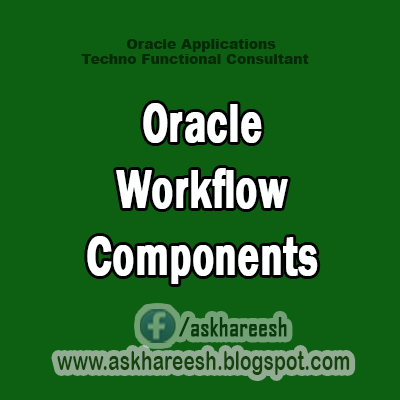 To send a signal or to communicate with the Workflow Engine, Oracle Applications provide several standard Workflow Engine application programming interfaces (APIs). Workflow Monitor is the component of Oracle Workflow that allows you to review the state or status of an item through any particular workflow process. Workflow Monitor can also be used by application administrators to push through certain items that have errored out. Workflow Monitor provides an overview of a given item in the workflow and helps with tracking. Workflow Definitions Loader is the component that allows you to download or load workflow definitions to and from the database or text files. Workflow Directory Services is the component that identifies the directory repository to be used, tells Oracle Workflow how to find the users, interprets the roles of each user, and sends notifications to those users when necessary. The Notification Mailer is a program that concurrently sends emails and receives responses from the Oracle Workflow Notification System. It will send out notifications and process responses by calling the response functions and completing the notification. Unlike Oracle Alert response processing, you do not need Oracle Office to use this functionality.